The trial results speak for themselves. 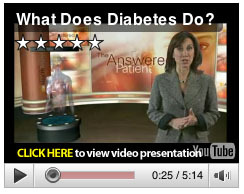 Can I take DiaMetrix® directly before a meal or do I have to wait 15-30 minutes? DiaMetrix is formulated for rapid tablet disintegration once ingested. Taking DiaMetrix anywhere from 15 minutes before to just before eating is the ideal time. Is DiaMetrix® OK for someone with Type 1 diabetes? DiaMetrix is designed to attack the cause of Type 2 diabetes (insulin resistance), which is quite different than Type 1. However, many people with Type 1 diabetes eventually develop some insulin resistance just like Type 2's. In this case, DiaMetrix would be helpful for someone with Type 1. Remember, DiaMetrix will not substitute for the need of someone with Type 1 to take insulin regularly, but it may help prevent them from becoming insulin resistant. How many tablets of DiaMetrix® should I take per day? Take 2 tablets before each meal, up to 6 tablets per day. NOTE: If you weigh over 200 lbs. take seven caplets per day. When should I take DiaMetrix®? DiaMetrix works best when taken before meals. How long does it take for DiaMetrix® to work? 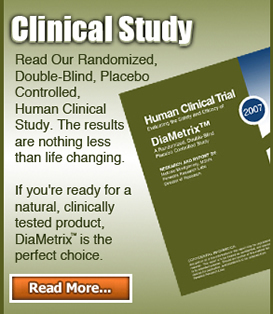 Studies show that DiaMetrix is fully effective within 30 days. Is DiaMetrix® safe to use? Yes. Toxicity testing on DiaMetrix has shown it to be safe when used as directed. Is DiaMetrix® a natural supplement? Yes, All active ingredients in DiaMetrix are found naturally in plants, either as extracts (herbs) or isolates (ascorbic acid, biotin), except one, Betaine HCL. Is DiaMetrix® effective for Diabetic Neuropathy? The two main factors that cause diabetic neuropathy are 1) neurovascular factors, leading to damage to the blood vessels that carry oxygen and nutrients to nerves, and 2) autoimmune factors that cause inflammation in nerves. 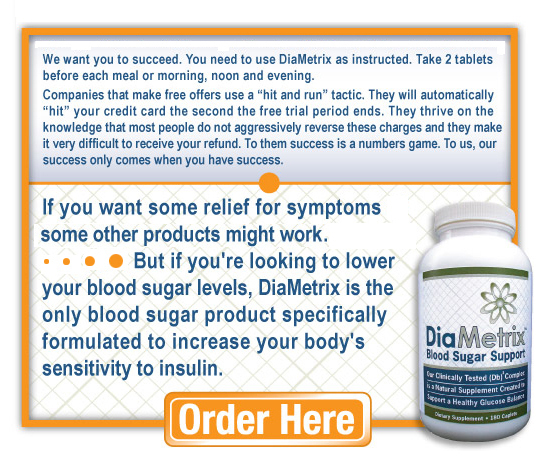 DiaMetrix promotes normalized blood sugar levels and reduced levels of inflammation. Have there been any credible studies done on DiaMetrix®? Yes (2). A preliminary trial was conducted in 2006 with positive results. This led to a larger 100 person, randomized, double blind, placebo controlled, human clinical study conducted in 2007. CLICK HERE to review the study results and conclusions. The Murine study was concluded in late 2010. CLICK HERE to review the study results and conclusions. Do I need a prescription to buy DiaMetrix®? No. DiaMetrix is classified as a dietary supplement. It does not require a prescription for purchase. If you are taking medications always consult with your doctor before using any herbal supplement. Is the glycemic index really helpful to people? Absolutely. You don’t need to eat a particular food to know what effect it will have on your blood insulin levels. This work has already been done on all major foods. Some foods cause little or no insulin to be produced in your body. Others cause a great amount of insulin to be produced. People with type 2 diabetes cannot metabolize carbohydrates properly, so it is important to eliminate or severely limit any food that causes significant insulin production. The glycemic index labels every food according to the amount of insulin it causes to be produced in the body once it is eaten. Glycemic index numbers tell us what foods are good choices for people with type 2 diabetes and what foods are not good.